Karly-Joanne, Joann Flora BBBS Director, and Svend-Karl pose before the Bowling for Kids Sake Event April 30th at the Ketchikan Recreation Center. 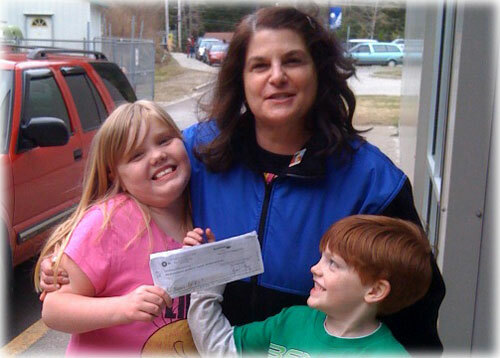 9-year old Karly-Joanne Klein-McMahon a member of the Tweetie Birds Team raised over $4,000 for the Ketchikan BBBS program making her one of the highest fundraisers in the state for Big Brothers Big Sisters of Alaska. The Bowl for Kids Sake Event is from 10 AM-4PM today at the Rec Center -- all the teams are still taking donations. Fish Factor: Salmon season soon to officially get underway By LAINE WELCH - Alaska’s 2011 salmon season officially gets underway in two weeks! While trollers in Southeast Alaska provide Chinook salmon to markets nearly year round (their spring fishery got under way April 25), it is the runs of reds and kings to the famous Copper River that mark the official start of Alaska’s salmon season. State managers have announced May 16 as the first opener there, three days later than last year. The Copper River forecast calls for a catch of 1.2 million sockeye salmon, 9,000 kings and 293,000 cohos this season. Fingers are crossed that the catch will come in on target, unlike last year when Copper River salmon catches were well below the 10 year averages. Sockeyes, for example, yielded a harvest of 636,000 fish, about half of what was expected. Overall, last year’s statewide salmon catch of 171 million fish was valued at $534 million at the Alaska docks, the best showing in 18 years. (And that doesn’t include bonuses or other post-season price adjustments.) State managers predict even better salmon catches this year – nearly 204 million fish. If the catch comes in on target, it will be the fifth largest salmon harvest on record. Alaska: Governor Defends Resource Development, Access, and Jobs on BLM Lands - Governor Sean Parnell has directed the Alaska Department of Law to participate in, and support a lawsuit against the federal government filed by the State of Utah. Utah filed a complaint Friday against the Bureau of Land Management (BLM) that targets the recently created federal “Wild Lands” policy. In December 2010, U.S. Secretary of the Interior Ken Salazar imposed an order significantly changing how BLM manages public lands. The new BLM policy arbitrarily creates a new public land designation of “Wild Lands,” directs federal agencies to protect the wilderness values of such lands, creates additional potential costs and delays in the permitting process, and overrides existing regional land use management plans. “States, local communities, and residents, particularly in Western states with a large amount of BLM lands, deserve far better from the federal government,” Governor Parnell said. “Now is not the time for the federal government to impose new hurdles to developing America’s oil, gas, and other natural resources. Alaska: Three Indicted for Widlife Trafficking & Firearms Crimes; Charged with Illegal Trade of Walrus Ivory and Polar Bear Hides - United States Attorney Karen L. Loeffler announced Thurdsay that three people were indicted by a federal grand jury in Anchorage for one count of felony conspiracy to violate the Lacey Act, six counts of Lacey Act violations, one count of being a felon in possession of a firearm, one count of illegal possession of a machine gun, and one count of possession of an unregistered machine gun. The 10-count indictment names as defendants, Jesse Joseph Leboeuf, also known as Wayne Gerrard Christian, 47, Loretta Audrey Sternbach, 52, both residents of Glenallen, Alaska, and Anchorage resident Richard Blake Weshenfelder, also known as Rick Weshenfelder, 50. The three defendants were arraigned Thursday, before United States Magistrate Judge John Roberts. Alaska: On-the-job death rate down in Alaska; Still one of the highest in the nation - Although Alaska has consistently had one of the highest work-related fatality rates in the nation, several agencies have teamed up over the past decade to significantly reduce the incidence of work-related deaths in our state. Using work-related fatality data, state and federal government agencies, industry, and nonprofit organizations identified hazards, and developed and implemented interventions to address them. Examples of such interventions include policy changes, engineering controls, education/training, and the use of personal protective equipment. During 2000–2009, 379 work-related fatalities occurred in Alaska, a 42.5-percent decrease from the previous decade. For example, commercial fishing deaths declined from 202 in 1990–1999 to 111 in 2000–2009. Pilot deaths declined from 104 to 47. Alaska: DOT&PF Reminds Motorists to Remove Studded Tires - The Alaska Department of Transportation and Public Facilities (DOT&PF) reminds motorists that studded tire season ends statewide on May 1. Saxman: Nathan Jackson Artwork Dedication at Saxman Community Center - On Friday May 6th, 5pm, the City of Saxman will be hosting a dedication ceremony for a new cedar bear screen carved by artist Nathan Jackson. The event will take place at the Saxman Community Center, located at 2841 South Tongass Highway. Craig - Public Hearing to be held regarding changes in deer harvesting reporting in Unit 2 - The USDA Forest Service, on behalf of the Federal Subsistence Board, will hold a public hearing on Wednesday, May 11, 2011 starting at 6:00 p.m. in Craig, Alaska. Alaska: Haines and Sterling Students Place First in KidWind Design Challenge - A team of four students from Haines High School won first place for high schools in the 2011 KidWind Design Challenge, a new statewide competition that tests students’ ability to design a wind turbine. A team from Sterling was the top middle school team. More than 50 teams from schools around the state participated in the competition, which was sponsored by University of Alaska Fairbanks’ Alaska Center for Energy and Power and Renewable Energy Alaska Project in conjunction with the U.S. Department of Energy Wind for Schools program.